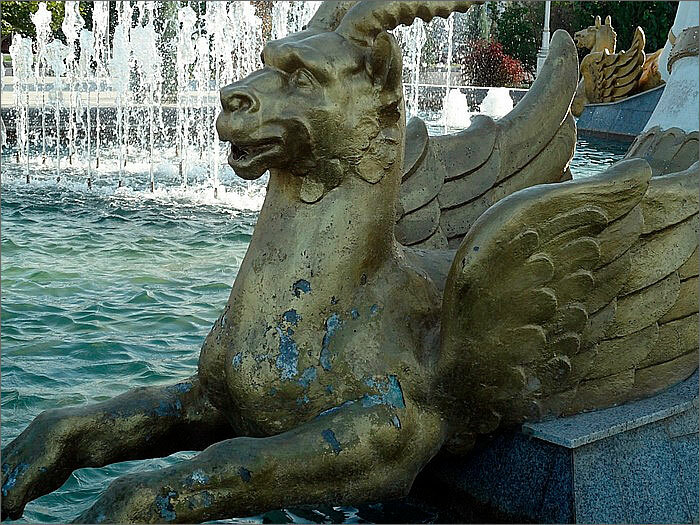 The Park of Independence is undergoing reconstruction in Ashkhabad (Turkmenistan). Fountains, paths, and young trees planted to replace of the previous old ones, all look beautiful only in their first year. Gradually, but relentlessly, time takes its destructive toll and the ostentatious luxury of the facades, does not hide the physical and social decay of the town. Finishings fall off, weeds growth through cracks in the tiles, rats and night visitors become the town’s guardians, leaving behind them vile piles of rubbish. Social activist and Ashkhabad resident Natalia Shabuntz told Fergana’s editorial team about how her disintegrating town. Morning walks in the Park of Independence Park are a big pleasure, especially in the summer. Cool fountains gently murmur and you can sense the blissful smell of the subtropics in the breeze. 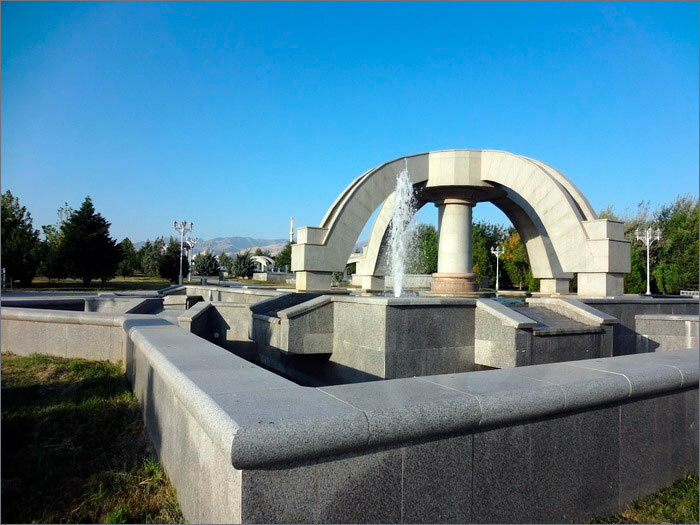 During the reconstruction of the park from the Prospekt Mira side during the Renaissance (during the rule of Second Turkmen president G. Berdimuhamedov – ed) white marble with its obvious rusty stains was replaced by grey, and the fountains became more pompous. During the reconstruction works, the plants were no longer watered and many unique trees dried up. I called the city administration, but it was useless. Some of the plants growing on the lawns alongside the roads were destroyed, “for motorists’ safety”. In April 2009, when the park was open after reconstruction, its vegetation looked obviously thinning. New trees had been planted, but there were no rose bushes. However, the renovated fountains, with their musical accompaniment, pleased visitors with their water symphonies. Unfortunately, some of the fountains soon broke down and the music stopped. However, care for the trees and lawns was impeccable. Since last year, to the chagrin of the residents, the fountains worked less and less frequently – you were more likely to see the fountains with opened tiles. Now they are switched on only from time to time and former water cascades are nowhere to be seen. This summer, the trees have hardly been watered, the lawns have become balder and overgrown with weeds, weaving between the tiles. 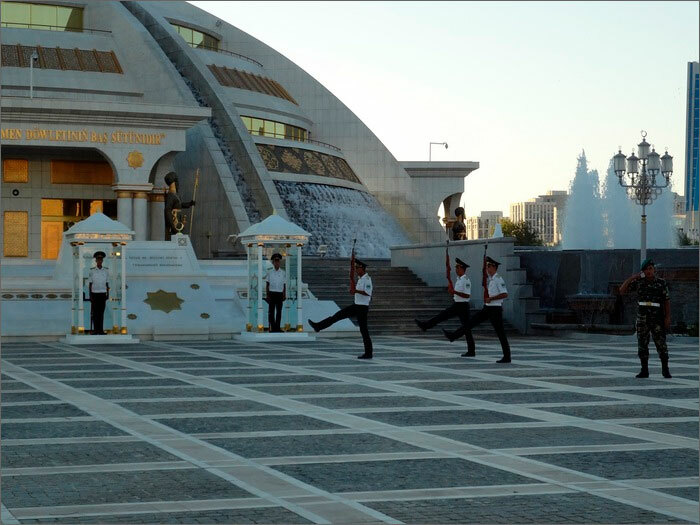 The Moskovsky Prospekt side of the park was reconstructed more than a year ago (and the decay is already eating its way through it) and recently – part of the park running along the side of Turkmenbashi shayol has been done up (everything works there for now). If anybody accuses me of only seeing the negative, they will be wrong. It hurts me to see how quickly everything falls apart as a result of low quality construction work. This beauty is expensive and short lasting. 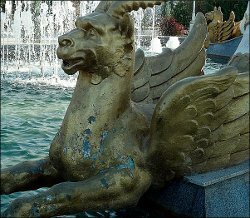 The paint peeling off the griffin in the fountain is a bitter symbol (it was “fixed” last May). A few days ago I wanted to see the neat and triumphant changing of the guard near the Independence monument (this architectural masterpiece is known as the “octagon”, but the army commander shouted that photography is banned. I did not understand why – it is not a military object after all. Are the ones taking the photos really guilty that tiles quickly stuck on to building fronts are falling off? Are they to blame that the ceiling and chandelier collapsed in the canteen of children’s summer camp Nesil in Gyok-Der (Chuli) this July (thankfully during a shift change). The problem of the Independence Park is not only that materials and quality filters were economised on, or even the lack of experience of the workers who look after the park. The behaviour of its late night visitors is appalling – people leave rubbish, including condoms, everywhere, despite the park being equipped with bins. Recently rats have appeared in the park in large numbers. They chew through tree roots, cables and even eat the foam laid between the tiles. Around seven years ago, stray cats came to live in the park, but now they are being eradicated, and the number of field mice has significantly increased. 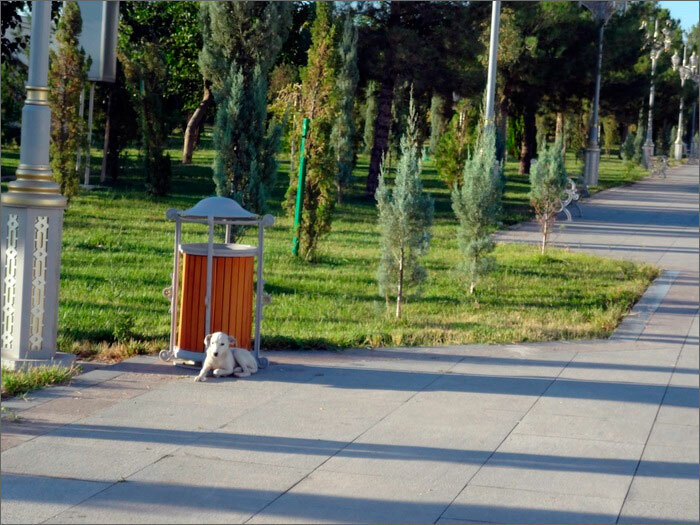 More recently, dogs have come to live in the park, and some are looked after by the park staff. 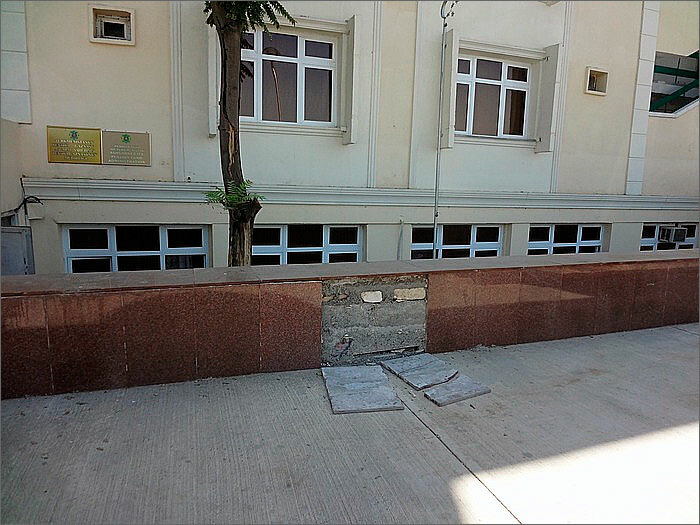 Town workers are also taking great care to destroy them. Rats are now running the park. During the war, when the blockade of Leningrad was broken, cats were taken into the city overran by rats…Yet Ashkhabad smells of carrion: poisoned cats hide in basements to die, and nobody takes their bodies away.